SAN MATEO (November 17, 2011) – Award-winning independent children’s app developer Duck Duck Moose today is pleased to announce its new Peek-a-Zoo book app, which is available for iPhone and iPod touch on the App Store. Designed for toddlers, Peek-a-Zoo encourages children to learn the names of animals and identify different details, such as actions, emotions, positions, and attire. Animals are dancing, eating, wagging their tails, wearing sunglasses, sleeping, and much more! 1. Learn the names of animals: alligator, cat, chicken, cow, dog, elephant, giraffe, hippo, lion, monkey, mouse, panda, penguin, pig, seal, skunk, walrus, zebra, and an imaginary “squirgle”! Peek-a-Zoo is the tenth iOS title released by Duck Duck Moose, following award-winning titles such as Wheels on the Bus, Old MacDonald, Itsy Bitsy Spider, Fish School, Park Math, Word Wagon, and Puzzle Pop. Duck Duck Moose has also recently released its first Android app: Wheels on the Bus. Peek-a-Zoo 1.0 is only $0.99 USD (or equivalent amount in other currencies) and available worldwide exclusively through the App Store in the Books category. 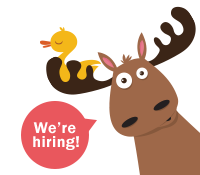 Duck Duck Moose is an award-winning creator of educational children’s mobile applications for iOS and Android. It was founded in 2008 by three friends who are parents themselves, and share a passion for children, music, education, design, and play. Duck Duck Moose has created ten top-selling titles: Wheels on the Bus, Old MacDonald, Itsy Bitsy Spider, Fish School, Baa Baa Black Sheep, Park Math, Word Wagon, Musical Me! Puzzle Pop, and Peek-a-Zoo. Wheels on the Bus won the KAPi Award for “Best Children’s App” at the 2010 International CES and was featured as one of The New York Times’ “Best iPhone Apps for Kids.” Park Math won the “2010 Best Kids’ iPhone/iPod App of the Year Award” from iLounge. The Company has won eight Parents’ Choice Awards and nine Children’s Technology Review Editor’s Choice Awards for Excellence in Design. Copyright (C) 2008-2011 Duck Duck Moose. All Rights Reserved. Apple, the Apple logo, iPhone, iPod and iPad are registered trademarks of Apple Inc. in the U.S. and/or other countries.